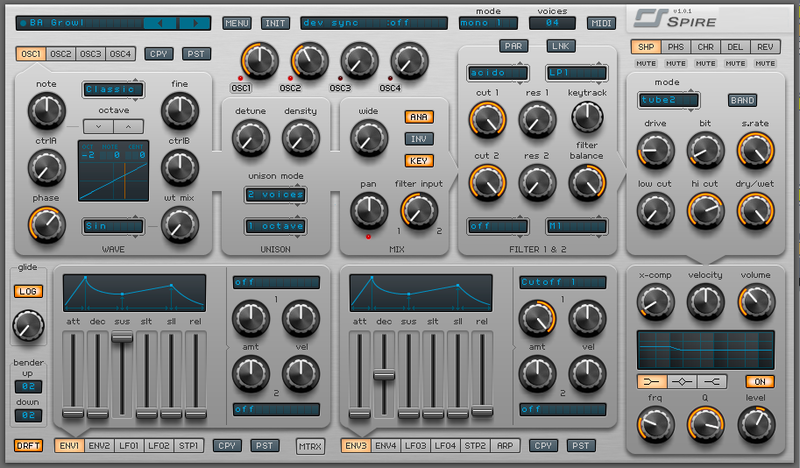 Spire, created by Reveal Sound is a versatile hybrid synthesizer capable of creating everything from simple sounds to complex multistage waveforms. Its immense power is wrapped up in a relatively simple user interface to allow for maximum routing flexibility and processor efficiency. Here we’ll take a look under the hood of Reveal Sound’s Spire to see how you can get the most out of its features. You can also sign up for Splice and check out some projects that use Spire below. At the heart of Spire are its four independent oscillators modules, accessible at top left. Each oscillator is identical in operation, so it’s a breeze to dial in your settings and get right to business. You have four oscillator modes to choose from: CLASSIC, which allows you to crossfade between a saw and a square waveform; NOISE, which allows you to generate atonal noise that you can then shape by using the filters; FM, which allows you to use frequency modulation synthesis algorithms comparable to the famous Yamaha DX7; AMSYNC, which combines oscillator sync with amplitude modulation; and SAWPWM, which allows for sawtooth pulse width modulation. Just to the right of the oscillator section is the OSCILLATOR MIX section, which you can use to control the relative amplitude of each oscillator’s output. Each oscillator module is also equipped with a WAVE SELECTOR menu that allows you to choose one of 49 unique wave tables and a WET MIX knob to adjust the amplitude of the wavetable relative to the output signal. The CTRLA and CTRLB knobs assume different functions depending on the selected oscillator mode. Spend a few minutes experimenting with these controls, and you’ll be pleasantly surprised by the wide range of timbres that Reveal Sound’s Spire can create. Reveal Sound’s Spire has several voicing modes to choose from, and each will have an affect on the way that it handles incoming MIDI information. For creating bass or lead patches, it’s preferable to choose one of the four monophonic modes, whereas the two polyphonic modes are better suited to synthesizing chordal or harmonic timbres such as keys and pads. You can also control the number of maximum allowable voices that Spire will create by specifying so on the top of the unit’s GUI. Spire also gives you several options for adjusting portamento behavior: The GLIDE knob determines how long it will take for one pitch to glide to the next; the BENDER selector allows you to adjust the operable range of your pitch bend wheel; the LOG switch toggles between linear and logarithmic sliding curves; and the DRIFT switch toggles Spire’s ability to introduce random pitch variations to the signal, as is commonly found when using classic analog synthesizers. Spire also has a powerful unison module that allows you to stack up to nine voices per oscillator simultaneously, as well as a signal control module that provides you with further options for thickening up your sound or spreading it out in the stereo field. To activate the unison module, simply choose your desired number of voices from the VOICE SELECTOR and then choose the desired unison algorithm from the UNISON SELECTOR. Reveal Sound’s Spire provides you with nine distinctly different unison algorithms to allow for octave doubling and chordal constructions. The signal control module is comprised of a PAN CONTROL for placing your sound in the stereo field; a WIDTH CONTROL for determining the sound’s width in the stereo spectrum; and a FILTER CONTROL that allows you to determine how much of the oscillator’s signal will be sent to each of Spire’s filters. The powerful modulation features within Reveal Sound’s Spire make it easy to create fresh sounds that evolve and change over time. In the modulation section, you’re presented with no less than four envelope generators, four LFOs, two step sequencers, and a built in arpeggiator module, all controlled by a central MODULATION MATRIX. To assign modulation parameters, click on the MTRX switch at the bottom of the unit to bring up the matrix. Here you have fifteen modulations slots in which you can assign one or two modulation sources to up to four trigger destinations simultaneously. When you assign a modulation source and destination, you’ll see that you can easily modulate nearly every component within Spire, for virtually endless possibilities. Reveal Sound’s Spire provides you with twelve high quality filters, which can be run two in series or two in parallel. Activating the LINK switch at the top of the filter module will link both cutoff frequency knobs together. You have three filter banks to choose from containing four filters each: PERFECTO, which contains a Low Pass filter, Band Pass filter, High Pass filter, and a Peak Filter; ACIDO, which contains four different Low Pass Filters; and INFECTO, which contains a Low Pass filter, a Band Pass filter, a High Pass filter, and a Notch Filter. Each filter type excels at shaping your sound in particular ways; experiment with them to see which is most suited to your specific needs. Spire also sports a hefty sum of onboard insert effects that allow you to further shape and add color to your sound. It features five independent modules: SHAPER, PHASER, CHORUS, DELAY, and REVERB, each with effect-specific controls and a DRY/WET knob to control the blend of the affected signal with the dry signal. At the end of Reveal Sound Spire’s processing chain is the OUTPUT MODULE, which offers you several tools for fine-tuning your sound before it goes out to its respective channel strip in the final output stage. Reveal Sound’s Spire provides you with a compressor to restrict your sound’s dynamic range, as well as an onboard equalization module to cut or boost particular frequencies. This gives you a simple and powerful way to put the finishing touches on your sound immediately before the output stage and to enhance its particular characteristics. To hear Reveal Sound’s Spire in action, go ahead and check out some of our featured Splice projects that utilize it and get a sense of the versatility and power that this hybrid synth has to offer. You can download a demo of Reveal Sound’s Spire or purchase it for $189 right here at their online store. Splice is the cloud platform for music creation, collaboration and sharing. Sign up for free now!